MNA – Leader of Islamic Revolution Ayatollah Khamenei has warned Iranian officials not to be deceived by Europe and cause problems for the country. On the anniversary of the Popular Uprising of the People of Tabriz, which took place on February 18, 1978, thousands of people from the East Azerbaijan province met with Ayatollah Khamenei this morning. 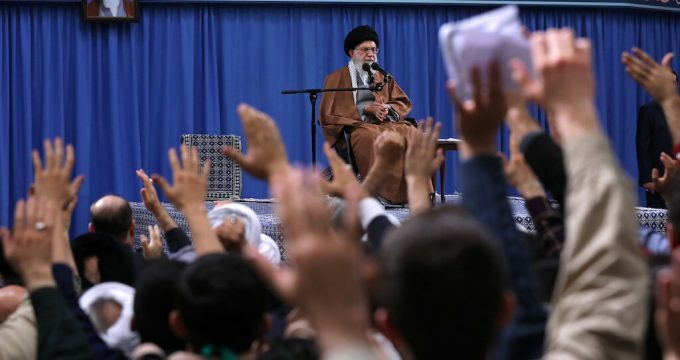 During the meeting, Leader of Islamic Revolution said while the US’ enmity with Iran has always been apparent, Europe meanwhile is trying to ‘trick’ the country. “I’m not telling the officials what to do, but I’m advising them to exercise caution [in dealing with Europe], so that they will not be tricked by them and cause problems for the country,” he added. Iran is currently holding talks with the EU for the launch of a trade mechanism that promises continuation of trade with the Islamic Republic in the face of US sanctions, as a means to convince Tehran to stay in the nuclear deal despite Washington’s withdrawal from the agreement back in May. “The enemy sometimes shows his teeth, sometimes his fists, and sometimes his smile; all of these [tactics] are the same; even their smile is out of animosity,” he stressed.